How do I use Editing Logic Function to change input value in array using enum preset value? I have two tabs in my UI: Array Input and an Enum input type. 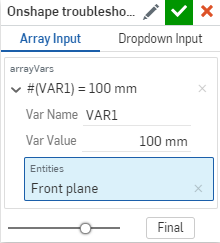 While the user can input the value into the array directly, I would like to enable the option of a dropdown in a different tab to override the array value if the dropdown enum is used/changed. 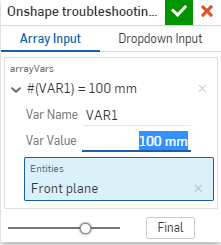 Almost like the array input value is a default. I've seen examples close to this and @NeilCooke suggested the Spur Gear script to someone else as it drives a third input from two other ones concurrently (I believe). It sounds like Editing Logic Function is the way to do this but I'm having some issues and I suspect the culprit is the data type being an array. I'm also just getting started with FS so perhaps there are a host of other reasons. Any input would be greatly appreciated. I attempted to copy the FS code below but not sure if the formatting is going to come through in the cleanest way. I can make a public version of this doc if that's easier. You were checking the optionTYPE != optionTYPE in every iteration of the for loop. Since that variable is not part of the array, it will always evaluate the same way, so you may as well only check once. The goal of this function is to change the `definition`, and then return that altered definition. `setVariable` will set a variable on the context (the same thing that the Variable feature does in a part studio), but does not change the definition. the `for (arrayVar in definition.arrayVars)` type of loop is actually providing you with a copy of each member of the array. So altering this `arrayVar` won't alter the definition itself. This is why I have changed it to a index loop, that syntax will actually alter the definition. To answer the general question, yes, no matter which "tab" is selected (in more general terms, no matter whether a parameter is visible in the feature dialog or not), it's value is always retained, and available in both the oldDefinition and the definition of the editing logic. When the editing logic is called, oldDefinition and definition will match each other in every parameter, except the one parameter that the user changed. You can then edit the definition as much as you want, and return it from the editing logic function to adjust the underlying parameters of the dialog. Awesome! Thanks, @Jake_Rosenfeld! This worked great and I appreciate the explanation for the edits. This will be a great reference to build on. The only tweak I made to your code above to get it to work was that I am out to change the "inputValue" instead of "inputName" and specify units of the assigned value. @Jake_Rosenfeld, a related question. What if I wanted to pass the definition.arrayVars[i].inputvalue another user input value that's stored in the array? How would I accomplish this? For example, if I had inputvalue1 and inputvalue2 in the array and I wanted to change inputvalue1 to be set equal to inputvalue2 depending on the enum selection, rather than just the static numbers we have above. Conceptually it seems straight forward but I'm not getting it to work. The use case is that this inputvalue2 would be a value that doesn't change and behaves similar to a 'default' that the user has control over. Going one step further, I made an option in the enum selection to create a manual entry override that I would also like to pass to inputvalue1 when selected. 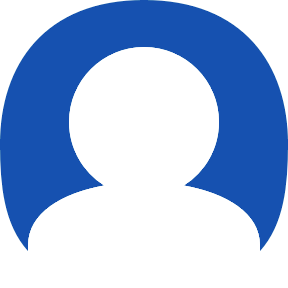 The manual entry input box is populated below the enum on the same 'tab'. Struggling to get that to work as well. Regardless of the tabs that these values live on, they are currently all part of the same context and map, correct? So, where am I getting caught out by calling their unique id at any moment in time (regardless of oldDefinition or definition)? I can provide some code if needed. Thanks in advance! Thanks again, Jake. Both answers worked out nicely. For those interested, my error on the first question was in trying to multiply the array values with integers and units. On the second question, my error was in thinking that the "ManualOverrideValue" needed to be specified as part of the Enum that enabled its entry rather than just being simply called as a definition of the main feature dialog.